IQM has been thoroughly evaluated by some the world's leading radiation therapy centers. More than 30 publications are available on this website, organized by topics of interest. Scroll down to learn more about the exciting features of IQM. Robert Heaton from the Princess Margaret Cancer Centre in Toronto, Canada presented the calculation model of the IQM System in terms of the physical characteristics and behavior of linear accelerators at the ESTRO36 Conference in Vienna, Austria in May 2017. Robert Heaton and his colleagues at the Princess Margaret Cancer Centre in Toronto developed a calculation method to predict the measured IQM signal for clinical IMRT fields. This poster was presented at the ESTRO36 conference in Vienna, Austria in May 2017. Download the publication by the IQM project team at the Princess Margaret Hospital, Toronto. This article was published in 2009 as a proof of concept for the IQM system. This article by Masahide Saito, published in the Journal of Applied Clinical Medical Physics compares the MLC error sensitivity of various measurement devices for VMAT pre‐treatment quality assurance (QA). This study used four QA devices (Scandidos Delta4, PTW 2D‐array, iRT systems IQM, and PTW Farmer chamber). Nine retrospective VMAT plans were used and nine MLC error plans were generated for all nine original VMAT plans. Download this article to learn about the unrivaled error sensitivity of the IQM transmission detector for systematic MLC errors, especially for small aperture sizes, such as for lung SBRT. 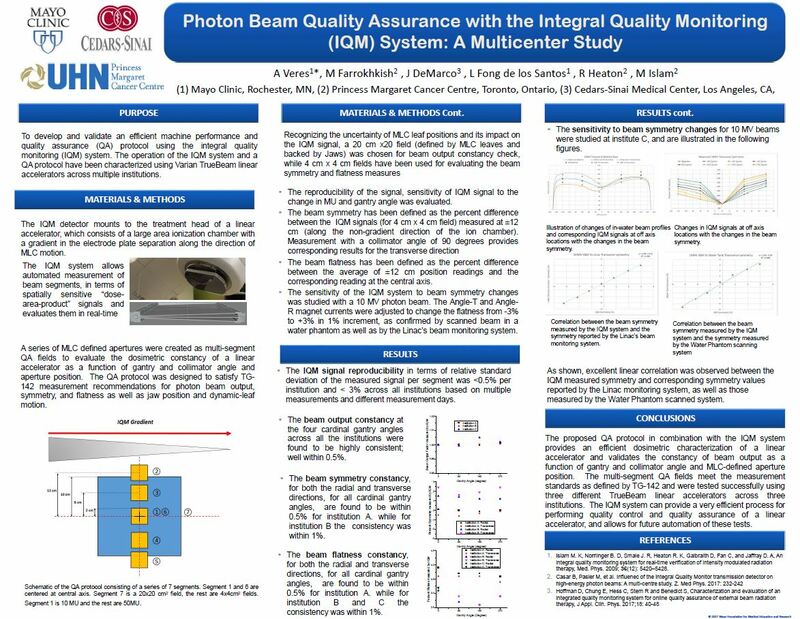 Makan Farrokhkish and his colleagues at the Princess Margaret Cancer Centre evaluated the beam monitoring performance of the IQM System to assess the accuracy and reproducibility of the linac beam delivery. The signal calculation accuracy and measurement reproducibility as well as the error detection capability of the IQM System was evaluated. For this study the author analyzed 52800 beam segments. Download the poster that was presented at the AAPM 2017 conference in Denver. Kilian Michel and his colleagues at the Lake Constance Radiation Oncology Center in Friedrichshafen, Germany evaluated the IQM System for Online Dosimetry during the patient treatment. The y checked the long-term signal stability, the error detection sensitivity for induced errors, the correlation of the IQM and the Dose-Volume-Histogram as well as treatment plan verification with the IQM System. David Hoffman, PhD at UC Davis evaluated the stability and accuracy of each feature of the IQM. This thorough review includes many comparative and illustrative graphics, and validated the IQM against its stated performance requirements and the site’s clinical standards. Download the full presentation given at the AAPM 2015 Meeting in Anaheim, CA. Lan Lin, Medical Physicist at Johns Hopkins University evaluated the accuracy,sensitivity and constancy of the IQM for conventional intensity modulated radiationtherapy (IMRT) and for rotational volumetric modulated arc therapy (VMAT). Download the complete poster that was shown.at the AAPM 2015 Meeting in Anaheim, CA. Jianguo Qian from the Johns Hopkins University, Baltimore draws the preliminary conclusion that IQM is a stable dosimetric system and can detect dosimetric deviations caused by small leaf errors in stereotactic radiation therapy. The sensitivity to leaf errors was demonstrated to be more pronounced for relatively small fields (i.e., small targets) in SBRT. IQM appears to be more sensitive than Mapcheck2 to small leaf errors in SBRT of small targets while showing similar sensitivity in SBRT of relatively large targets. Download the complete poster that was shown at the ASTRO 57 meeting in San Antonio, Texas. Marlies Pasler and her colleagues at the Lake Constance Radiation Oncology Center in Friedrichshafen, Germany investigated the potential of the IQM System to catch errors before they become clinically relevant. They also examined whether IQM would help them to improve the efficiency of their processes and finally they assessed whether IQM could successfully replace their current pre-treatment QA. They concluded that IQM could improve the efficiency of their workflow and that its error detection capabilities are sufficient for clinical practice. Download the full presentation that was shown during the ESTRO35 Conference in Turin, Italy in May 2016. Mr. Andrew Jung. (Member of the IQM development team at the Princess Margaret Cancer Centre in Toronto) evaluated the possibility to utilize the IQM system for a variety of Linac QA purposes. Download the full presentation that was given at the iRT booth during the AAPM 2015 meeting in Anaheim, CA. dose rate at which the dose is delivered. Download the IQM White paper to learn about the exceptional signal linearity and dose rate independence of the IQM system. IQM has been thoroughly evaluated at some of the world’s leading Radiation Therapy Centers. A variety of acceptance tests were performed as part of the installation routine at every clinical center. Download the IQM White paper to learn about the exceptional signal reproducibility of the IQM system. This comprehensive evaluation of the new large field ion chamber transmission detector, Integral Quality Monitor (IQM) addresses online external photon beam verification and quality assurance. Download the complete JACMP publication. Download the full presentation about the response characteristics of the IQM system with different beams. This presentation was given by Mr. Makan Farrokhkish, B.Sc. (Member of the IQM development team) at the World Congress on Medical Physics & Biomedical Engineering 2015 in Toronto. Makan Farrokhkish from the Princess Margaret Cancer Centre, Toronto states that IQM is well suitable to verify state-of-the-art SBRT treatments utilizing FFF Rapid Arc treatments on a Varian TrueBeam linear accelerator. Download the full presentation that was given at the iRT booth during the ASTRO 57 conference in San Antonio, Texas. Sonja Wegener and her colleagues from the University of Würzburg, Germany evaluated the IQM System for IMRT plan QA. The team validated the IQM Calculation algorithm for a wide spectrum of clinical IMRT cases. They then tested the error sensitivity of the IQM System with a variety of induced errors, and compared the error detection capability of the IQM System against their current IMRT QA approaches. The IQM found all the errors detected by their current IMRT approaches and detected several errors that were missed by the other techniques. Gabriele Guidi and his colleagues from Az. Ospedaliero Universitaria di Modena evaluated the use of IQM for the verification of TBI treatments. They investigated the influence of the IQM Detector on depth dose curves and beam profiles for an extended SSD of 170cm. The presentation outlines the considerations that should be applied when utilizing IQM for TBI verification. They concluded that IQM can be used for TBI verifcation. Download the full presentation that was shown during the ESTRO35 Conference in Turin, Italy in May 2016.